United States | Strike of Lightning! Artic Ice Cap in massive Meltdown! The Arctic ice cap shrank this year to a size never seen before because of an alarming acceleration of melting, according to data released yesterday by the World Meteorological Organization (WMO). According to the organization, which acts as a major arms UN scientists, the Arctic surface was reduced last September 16 to a minimum since satellite observations exist. That day, the thaw that began in March reached 11 million 830 thousand square kilometers, 3.3 million more than had been seen before. That thaw “extra” is comparable to the size of India, the WMO said in a statement. 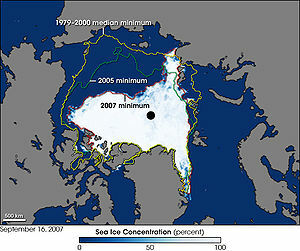 The size of the ice minimum on record (September 16) was even 18 percent below the record minimum of two years before. Introducing the state yesterday World Climate 2012, with the results of all extreme weather events occurred in the world from January to October, the WMO said the situation in the Arctic is further evidence of “the upheavals taking place in the oceans and biosphere “. The Secretary-General of WMO, Michel Jarraud, I think we should be alarmed by the pace “spectacular” thaw-observed not only in the Arctic but also in Greenland, because while the ice will be formed this winter “will be a thin ice and thaws more vulnerable to future “. “Definitely, our message is that the trend (the shrinking of the ice cap) not only continues but accelerates,” said the head of the scientific organization. On the other pole of the Earth, the Antarctic continent, the WMO said in March it reached its fourth largest historic -5 million square kilometers for the month of March (melt period), becoming 16 percent greater than the average for that month. In its expansion period (September), Antarctica recorded its largest size since 1979 up to 19.4 million square kilometers. To explain, Jarraud noted that the Arctic is much “more sensitive” to the Antarctic to increase and temperature variations. The Arctic, however, is more important for the global climate system, because without the ice ocean more solar energy would come and warm the sea, thereby reinforcing global warming. Only in Russia the temperature reached 50 degrees below zero. But this year also saw an increase in global temperature, which manifested itself in intense heat waves. Spring temperatures set records in parts of Europe and the United States. For most of March, much of both continents were affected by temperatures typical of summer. So, was the warmest March in Norway, the second to Switzerland, the third for Austria, Netherlands, United Kingdom and Germany, and the fourth to Denmark. Average temperatures from January to October were the highest on record in the United States and the ninth highest worldwide. The period from January to October was the ninth warmest since 1850. The global temperature of the earth and the ocean surface was 0.45 degrees Celsius above the average for 1961-1990, 14.2 degrees. Moreover, the hurricane activity was normal in the world, but above average in the Atlantic, where ten storms reached hurricane strength, including Sandy , who wreaked havoc in the Caribbean and the U.S. east coast. The sea level rises, warming the globe, 60 percent faster than projected in 2007 by a group of UN experts on climate, IPCC, a study indicated yesterday. The seas rise an average of 3.2 mm per year, according to a study by three climate experts and published by the British journal Environmental Research Letters . The projection “most reliable” of the IPCC in 2007, with data for 2003, provided for a rise of 2 mm per year until 2010. In its 2007 report, the IPCC estimated that the increase would be 18 to 59 cm by the end of the century, mainly due to the expansion of water, linked to warming. The rise could reach and even exceed one meter, say now numerous scientific studies. A figure deemed credible by one of the authors of the study led by Stefan Rahmstorf, of the Institute for Research on the Impact of Climate Change in Potsdam (Germany), which however does not focus on this point. “This means that areas less than one meter above sea level, where there is a large concentration of population and Bangladesh, will disappear,” said one of the authors, Grant Foster of Tempo Analytics American society . “There will be millions of climate refugees, and possible wars and all kinds of conflicts over access to resources,” he added. “In cities like New York, the effects are seen during Hurricane Sandy, “he added.